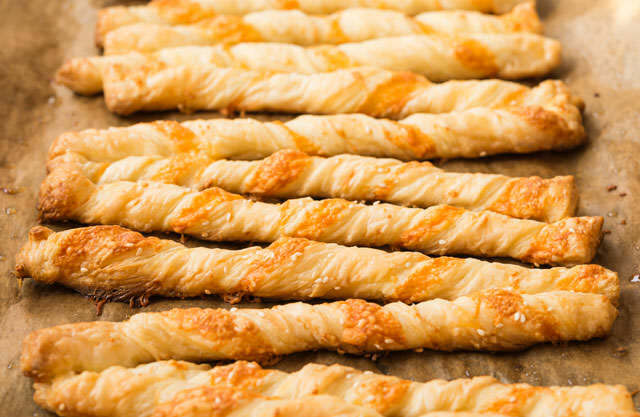 Twisted puff pastry strips laced with some cheese and herbs make easy and elegant appetizers. The best part? They are really, really easy to make. Combine the Parmesan, pepper and garlic powder. Unfold pastry sheets onto cutting board. Brush the sheets lightly with the egg white, then sprinkle each sheet with 1/4 of the cheese mixture. Lightly press into pastry, turn over; repeat. Cut each sheet into 12 strips and twist each strip. Place them on an ungreased cookie sheet and bake in 350 degrees for 15 minutes.